My MAME control panel is a customized version of the Classic by the now-defunct SlikStik (a nearly identical product is now available from MameRoom / North Coast). I'm going for broad single-player coverage and modest two-player coverage, with a prominently-placed 4-way joystick for older games. This panel has performed beautifully for many different types of games. As far as possible, I'm trying to keep a single player centered, not shifted off to one side. The "fighter groups" (8-way joystick with 7 buttons) and trackball are in well-established, standard SlikStik Classic positions. The two 8-ways play Robotron beautifully, even though they are farther apart than in the original arcade machine. The 4-way is in the lower row and centered, to maximize comfort for the older games. The blue button to the right of the 4-way is positioned for your left thumb when playing Defender. It and the blue button next to it are mapped to mouse left and right buttons. Along the upper row, the spinner must be to the left of the flight stick for Discs of Tron. The rotary must be to the left of the flight stick, for Battlezone and other tank games. This more or less determines the order of the items in the upper row. After that, buttons were added and items were moved around, until hand placement appeared comfortable for all classes of games. The blue buttons in the upper left corner are for games that put the spinner in your right hand (e.g. Tempest). The four buttons surrounding the flight stick are Player 1 & 2 coin and start. The black buttons in the upper corners are "pause" buttons. They become "quit" buttons when shifted. I have a Star Wars yoke and intend to make a separate panel yoke games and 270 degree driving games. The spinner may work as a steering wheel for 360 degree driving games, and the Qbert joystick may work as a shifter for some games, but I haven't tried them yet, because I don't yet have any pedals. many games can be played by one player but not two (Smash TV, Ikari Warriors, Blasteroids, etc.). Make a list of the types of games you want to play and their controls, and map them onto all the designs you come up with. Make full-scale paper copies, or, better yet, styrofoam or wood mock-ups of designs. For a photo of a mock-up I made, click here. This is especially important if you have more than one row of joysticks, since your forearm may bump joysticks in the bottom row when you're reaching for the top row. When using buttons and spinners, your hand rests on the surface of your panel. Make sure you leave adequate space for your hand to rest without inadvertantly pushing buttons. This is not a problem with joysticks, since they keep your hand up off the surface of the panel. My panel has just enough space around the spinner; if the spinner were 1/2" to the left, my left wrist would hit the upper yellow button in the player-1 fighter group. When you lay out your panel, don't forget to account for the switch connectors that stick out of your joysticks and allow extra space for the crimp-on connectors and wires that you will need to attach to them. You can find extensive information about components by searching through the BYOAC main forum. Since this website was first published and the above photo was taken, I've done some fine-tuning of the joysticks. The following descriptions are what I'm currently using. To the best of my knowledge, they provide the best game play available. The center 4-way is now a NOS ("new old stock") Wico 4-way leaf-switch/rubber-grommet joystick, with the stock 3.5" red ball top that came with it. I started out using a MsPac Reunion stick, as described below, but I found the engagement too slow to play Defender well. By "engagement," I mean how far you have to move the stick from center until it engages. This determines how large a "dead zone" there is in the middle of the stick's field of movement. For some games, the angle of engagement doesn't matter much, but for others, like Defender or Galaxian, a large dead zone cripples your ability to achieve high scores. I've also experimented with the Ultimarc J-Stik (which is identical to the Sanwa JLW), and find it just as good as my NOS Wico and less expensive and easier to find. It would be my choice if I were building a new panel today. 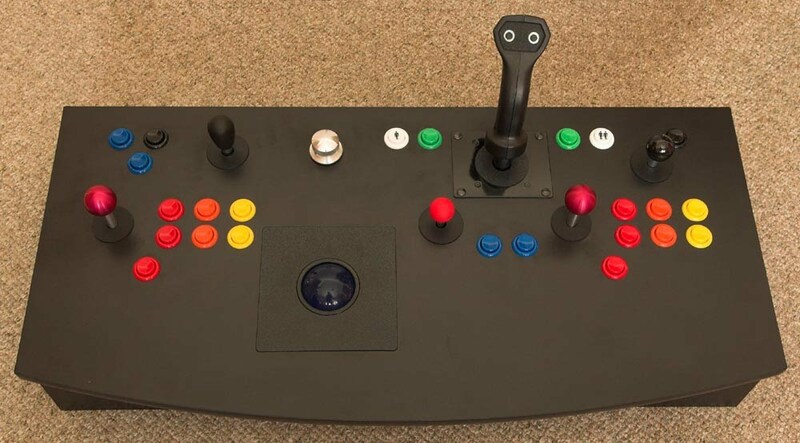 The other 4-way joystick, in Qbert orientation, is a "Ms Pacman / Galaga Reunion" stick (Happ Controls part #50-6084-1125R) with a shaft from TornadoTerrys.com. It has a 1 3/8" black phenolic ball knob (McMaster-Carr part #6046K17). It measures about 2 1/8" from surface of panel to top of ball. The 8-ways are Happ Perfect 360s with Kowal's mod, to make them engage more quickly and register the diagonals more easily (read about it here, here and here). Kowal's mod is a replacement actuator that is a simple cylinder of length 0.678", inside diameter 0.375", and outside diameter 0.541" (= 13.7 mm), made to +/- 0.001" tolerance . I had mine made of stainless steel, and I blackened the outsides with a black sharpie pen. The P360s have NOS adjustable-height 4" red Wico balltop shafts with the 1/8" spacers for metal panels that come standard with P360s. Installed, the Wico balltop shafts measure about 2" from surface of panel to top of ball. I'm using these shafts for their shorter length (quicker engagement), but the shorter length increases the perceived stiffness of the P360s' springs, so I've replaced the springs with ones from Happ Super joysticks, which are quite a bit lighter. Note that not all NOS Wico shafts support multiple heights. Click here for an image of one of my adjustable-height 4" shafts with 1/8" spacer installed, flanked by single-height 3.5" and 4" shafts. The shafts in the image have their shoulders lined up, so you can see their relative heights above the control panel surface. With these mods, I find the P360s lighter, faster, and more precise, and my Robotron scores are significantly higher. The MAME spinner situation is not quite perfect for me. The SlikStik Tornado spinner in my panel plays games like Tempest well, but it isn't a push/pull spinner, so it can't play the later levels of Discs of Tron, and its resolution isn't high enough to play Arkanoid well. I intend to upgrade it at some point. The one spinner on the market that is both push/pull and high-resolution is the TurboTwist High-Low from Groovy Game Gear. Unfortunately, I don't like the way it mounts to your panel (has to be precisely routed, which I doubt I could do perfectly). The BlackHawk spinner from (the now defunct) Apache Controls was beautifully made, very rugged, and played Discs of Tron perfectly, but it did not have enough resolution to play Arkanoid perfectly. Switch the rotary to a plain 4-way or 8-way joystick. You could still play tank games but not rotary games. Remove the rotary altogether, if you don't care about rotary or tank games. If you're a Golden Tee fan, you might eliminate the rotary and move the spinner to the left, leaving room for slamming the trackball forward without stubbing your fingers. Switch the flight stick to a top-fire. This would work OK for tank games, but not for Discs of Tron, since you need both the trigger and one thumb button for D.O.T. Remove the flight stick altogether. Alternatively, you could replace the rotary with a second flight stick, if you love tank games. The normal pushbuttons from SlikStik use microswitches, which are ultra-reliable, but loud. I bought replacement leaf switches, which are quiet but don't feel as nice. I find game play identical between the two. Until I get around to acquiring a cabinet, I'm putting the panel on a simple stand in front of my TV. Click here for more details. After using the panel for a couple of years, I'm still very pleased with the results. The up-front design work I put in was well worth it. There were no major surprises or disappointments. I'm amazed at how much joysticks can affect game play. When I first got the panel, I thought I liked the stock P360 joysticks. Over time, I began to feel that they were holding me back. After applying the modifications noted above, my scores in Robotron literally doubled! I've found that I'm not as excited about rotary games (e.g. Ikari Warriors) as I thought I would be. If I had it to do over again, I might replace the rotary with another flight stick. I'm able to play tank games very well with the flight stick in my right hand and the 8-way rotary in my left hand, but having two flight sticks would be very cool. On the other hand, it's nice to be able to play a rotary game once in a while, and have it available for guests who may like those games. For games that use a horizontally-oriented 2-way joystick, like Galaxian and Puzzle Bobble, I find that I can play at least as well, maybe better, using a pair of buttons to move left and right, instead of using a joystick. For a higher resolution photograph, click here. To print out a full-scale paper copy, open this PDF file with a recent version of Adobe Reader and print it, with "Page Scaling" set to "None" and "Auto Rotate and Center" NOT checked. Then just tape the sheets together; no cutting is necessary. If you have Adobe Illustrator, you can make your own modifications to this layout by downloading this PDF file and editing it with Illustrator. For the keyboard encodings programmed into my I-PAC, click here.